Follow the latest updates from Yemen as Saudi-led forces bomb Houthi targets. A Saudi-led coalition of 10 countries has launched air strikes on Houthi targets in Yemen. As thousands of Yemenis gather in the city of Taiz in support of the Saudi operation, thousands of pro-Houthi protesters carried out a rival protest in the capital Sanaa to denounce the air strikes. UAE Minister of State for Foreign Affairs, Anwar Gargash, says "the decision to launch Operation Decisive Storm wasn’t a rushed decision". "Since the Houthi coup and aggression that stretched out all across Yemen where they wanted to impose their jungle law on their people, we had to make a decision and support the legitimacy in the country for the sake of Yemen and its citizens." Mahjoob Zweiri, a professor of Middle East history at Qatar University, comments on Saudi Arabia's military intervention in Yemen. Syria expresses its deep concern about the "ongoing and dangerous" developments in Yemen. The state-run SANA news agency cited a foreign ministry source saying "Syria calls for dialogue among the Yemeni parties to arrive at a political solution that meets the will and aspirations of the Yemeni people". 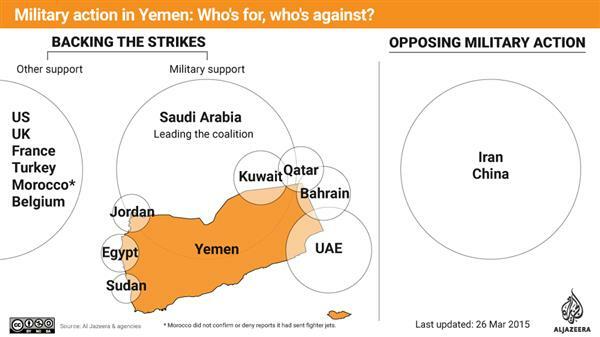 Military action in Yemen: Who's for, who's against? A Saudi-led coalition has begun hitting Houthi targets in Yemen. But who is supporting the action? And how? Lebanon's Hezbollah condemns the Saudi-led strikes, saying it takes the region towards increased tension. "Hezbollah continues to always stand by the steadfastness of the Yemeni people when it comes to their independence and choices in governance”. Hezbollah urges Saudi Arabia "to end its blatant oppressive aggression at once" and asks the Yemeni people to unify in order "to reach a full political solution". President Hadi has arrived in Riyadh before heading to Sharm el-Sheikh for the Arab Summit, Saudi State TV says. At least six children under the age of 10 were among a reported 25 people killed in Saudi Arabian-led air strikes in Sanaa on Thursday, Amnesty International reported after speaking to hospital officials and eyewitnesses. The group said the dead were being pulled from the rubble of 14 houses that were hit in a residential neighbourhood near the city’s international airport. 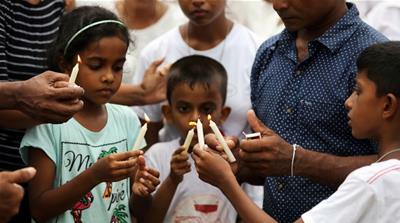 The rest of those killed were men, mostly in their 30s and 40s, Amnesty said, adding that it is believed that more people may still be buried beneath the rubble. Red the full statement HERE. We're getting reports that Saudi air strikes target the Tariq Air Base in Taiz, central Yemen. Al Jazeera's Mohamed Vall wraps up Thursday's developments. A look at how Shia rebels seized large swaths of territory, eventually prompting Saudi-led military intervention. 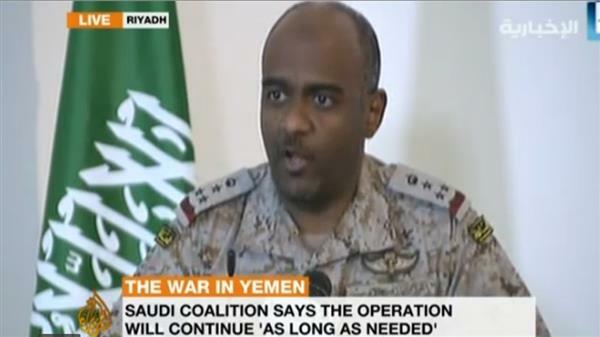 The spokesman for the Saudi-led coalition has said the operation against Houthis in Yemen will continue "as long as necessary." He said that the goal is to restore the "legitimate" government of President Hadi. 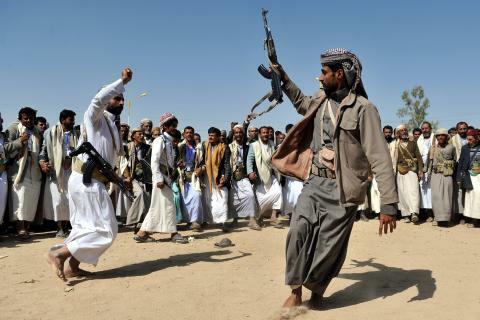 Al Jazeera received reports that new air strikes have targeted a reception camp of new recruits joining forces loyal to ousted President Ali Abdullah Saleh, west of the capital Sanaa. Saudi air strikes reportedly hit Houthi rebel positions at al-Anad Air Base in Aden, sources told Al Jazeera. Houthi spokesman Mohammed Al Bukhaiti spoke to Al Jazeera live from Sanaa earlier today, describing Saudi-led air strikes as "unlawful and unjustifiable". 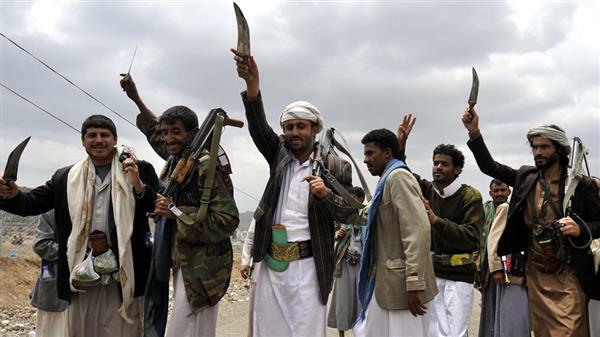 Reports say Houthi stronghold of Saada in northern Yemen hit by Saudi-led air strikes. Hakim al-Masmari, editor of Yemen Post, says powerful explosions rocked Sanaa tonight as more Houthi targets were attacked. 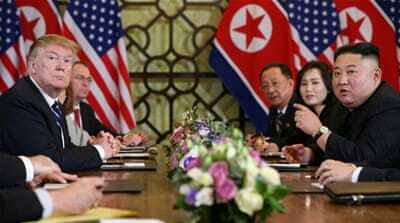 He describes the city as a ghost town with no traffic and civilians seeking shelter in locations considered safe. Ibrahim Sharqieh, a Georgetown University professor specialising in conflict resolution, discusses the military intervention in Yemen. Saudi Arabia and its Gulf allies have presented powerful members of the UN Security Council with suggested elements for a resolution that would impose an arms embargo on Houthi rebels. Diplomats said after a meeting with ambassadors from the United States, Britain and France that members of the Gulf Coordination Council want the resolution to be militarily enforceable under Chapter 7 of the UN Charter. The GCC members also presented the Security Council president with a letter explaining that their airstrikes targeting military installations held by the Houthi rebels are in response to President Abed Rabbo Mansour Hadi's request this week for immediate aid as the rebels closed in. Saudi Arabia and its allies have bombed the 131 infantry brigade in Kitaf in the Saada region, near the Saudi-Yemeni border. A Saudi led strike has struck a Houthi ammunition depot in the eastern part of Sanaa. Al Jazeera Media Network condemns the invasion of Houthi rebels on its bureau in Sanaa on Thursday. 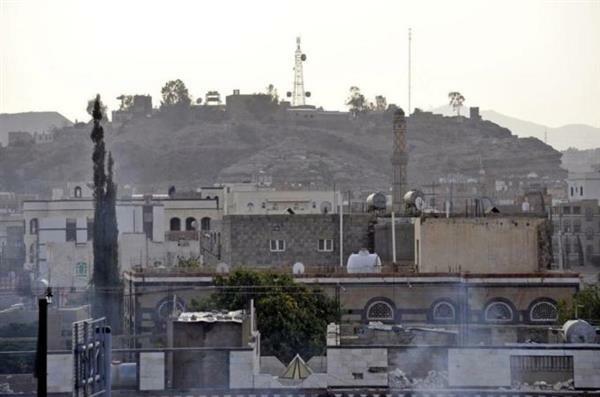 Armed Houthis stormed the bureau as guards reported that the rebels destroyed security cameras, smashed the entrance door and ransacked the office contents. Al Jazeera’s bureau has been operating legally and has been accredited by the information ministry in Yemen ever since it was established in 1996. No one was harmed during the raid as the bureau had been recently cleared for security reasons. League summit that will focus on the Saudi-led military campaign against the Houthis.